Every Sunday night, my group of friends gathers together, brings snacks, and gets cozy to watch Game of Thrones as it airs. This marks one of the few times in the week that any of us will watch live TV, save for some episodes of Broad City or the news. According to the latest Nielsen Total Audience Report, this is the norm for younger audiences. Viewers age 18-34 watch the smallest amount of live TV, a mere 29 percent of their total media diet, compared to 35 percent for 35-49 year olds, and a whopping 53 percent for audiences age 50 and older. When looking at the total time spent per week, the difference is even more staggering. 18-24 year olds watch 16 hours and 18 minutes of live TV per week. People 35-49, by comparison, watch double that amount (32 hours and seven minutes a week), while those 50-64 take in 44 hours and six minutes of live TV each week. These findings echo some things we already know: younger audiences prefer to fit media into their lives, rather than fit their lives around media. Convenience is king, be it the convenience of time or place. That’s why we see digital platforms (PCs, smartphones, and tablets) pull in the highest share of content (39 percent) for 18-34 year olds. For those age 35-48, digital devices and live TV are pretty evenly matched at 36 percent and 35 percent, respectively. In fact, as of March 2016, 72 percent of households have access to a DVR or subscription video on demand (SVOD), up from 67 percent this time last year. Furthermore, SVOD is more and more prevalent in households, while DVR rates have remained steady. SVOD has the location and platform advantage, allowing content to be viewed out of the living room on mobile and other connected devices. TV Everywhere is an initiative by cable providers that allows cable customers to access programming across devices and on the go. An example is apps like HBO Go, FX Now, or Watch ESPN where a subscriber uses their cable credentials to login. Just as SVOD has grown, TV Everywhere services are expected to be utilized by 70% of cable customers by 2017. 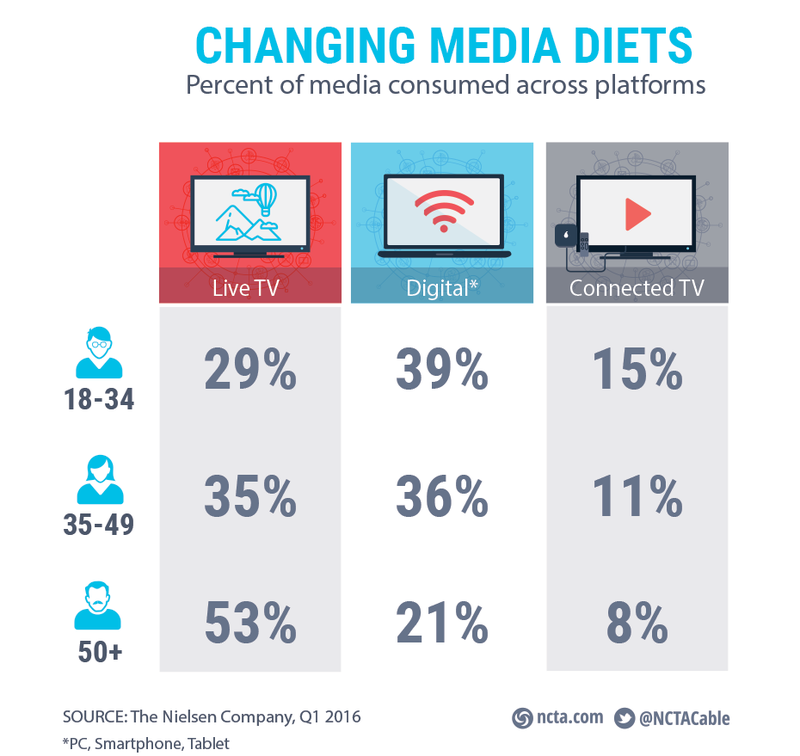 For other up-to-date information on viewer habits and media consumption trends, be sure to check out the Industry Data section of the NCTA website, or our page about mobile apps and the future of TV.